It is that time of year, the rhubarb is ready. What a treat it is to harvest something fresh from the garden now when even the trees are struggling to wake up from the winter. We’ve already enjoyed rhubarb crisp, and today I’m picking more stalks to make my husband’s favorite, cinnamon-fragrant rhubarb bread. Rhubarb is easy to grow, but like a like of northern perennial plants, it requires a period of dormancy. That means it is definitely not a plant for the Deep South. Each fall my rhubarb patch — which stands guard at the end of the two rows of raspberry canes — gets an application of compost and a thick mulch of hay once it goes dormant. In the spring when things start to thaw, the tender stalks spring forth. 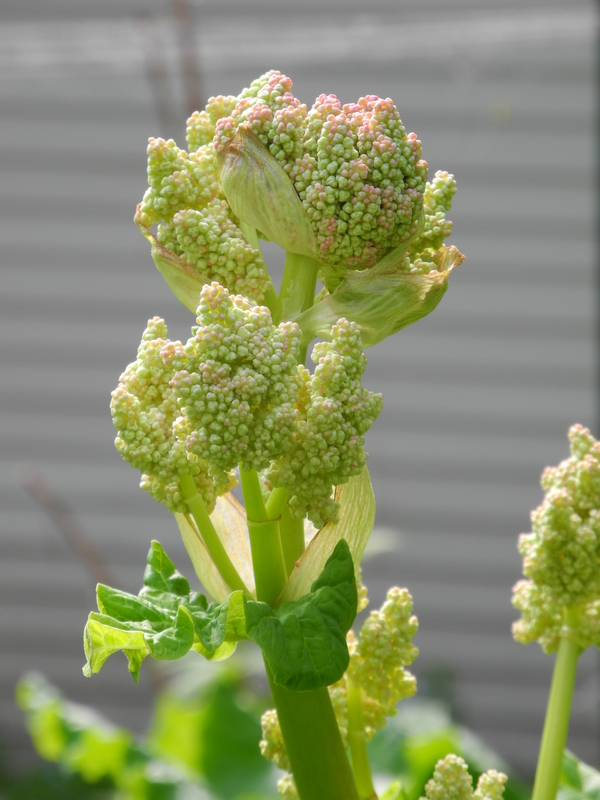 Occasionally rhubarb will send up a bloom stalk, which should be removed as it redirects the plant’s energy. Avoid harvesting too many stalks from a particular plant as this too can weaken the plant. It is important to plant several and give them room to divide and spread so you’ll have plenty of rhubarb to enjoy fresh in baked goods and even have enough to stash in the freezer for treats later on. To harvest, just select a stalk and holding it near the base, give it a tug at a slight angle from the base of the plant. The stalk should pull away without breaking. 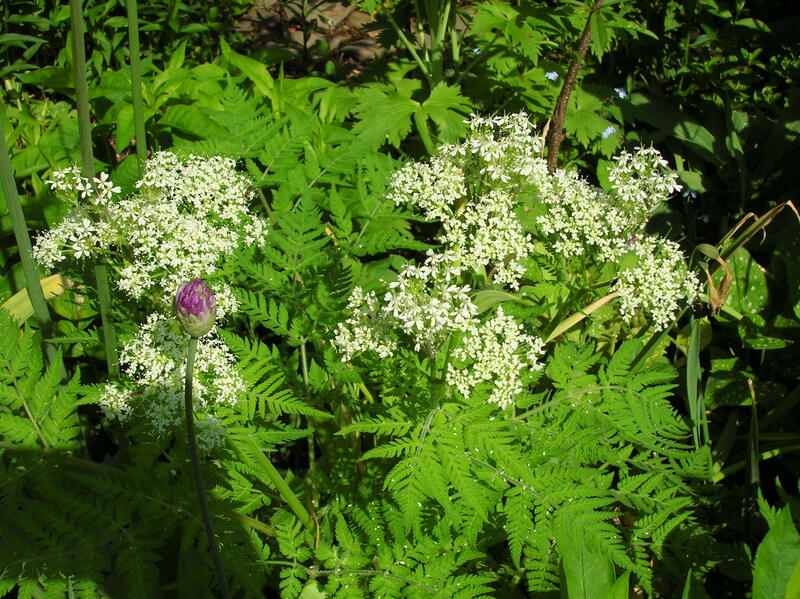 Anyone who grows rhubarb should also consider growing Sweet Cicily, a perennial herb with attractive fern-like foliage. This old-fashioned herb has many uses and in Colonial times its seeds were harvested and crushed for their oil. 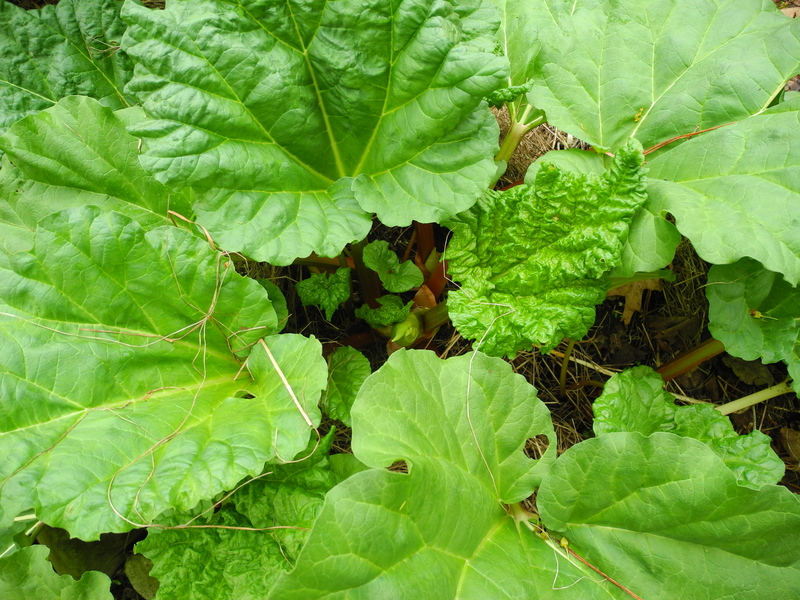 Today we grow this plant to help naturally sweeten rhubarb dishes and reduce the amount of sugar. You’ll need to experiment a bit, but I find that about a tablespoon of minced leaves added to the rhubarb in a crisp recipe for example, will “sweeten” it up nicely along with the sugar/oat topping. As the season progresses, the Sweet Ciciy will put out lacy panicles of white blooms. Here’s the rhubarb bread recipe which is from my friend Susan Manning, who it also happens I got my start of rhubarb from as well! It makes two small or one large loaf, which is even better the next day. And my recipe for rhubarb crisp with a brown-sugar and thick cut oat topping. Combine eggs, oil, sugar, rhubarb and nuts. Mix dry ingredients together and blend into rhubarb mixture. Divide between two loaf pans (4×8) or one large (5×9) loaf pan which has been greased and dusted with flour. Bake at 350 degrees about one hour or until loaves test done. Cool completely on rack and wrap in waxed paper. In a one and half-quart baking dish, spread rhubarb and sprinkle with the Sweet Cicily and cinnamon. Combine the oats, flour, brown sugar, oil and salt. Spread topping on rhubarb and bake at 350 degrees for 40 minutes. Serve warm.